SYNOPSIS: Just as the hugely popular Welcome Back, Kotter was coming to a close Gabe Kaplan used his fame to star in his first theatrical film. A few years earlier sports comedies like The Longest Yard and The Bad News Bears were box office hits. This film has it's action set around basketball. 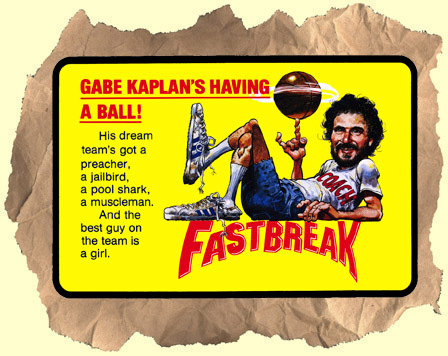 Kaplan plays a sports fanatic who gets a chance to coach a college basketball team. The players are made up of misfits and oddballs that he recruits. One is fugitive, one a muscular football player and another is a girl (dressed like a man). But with Kaplan's guidance they can all play ball really well! This ultimately lighthearted story avoids a lot of sports film cliches. The characters are all fleshed out and story is believable. It's not a wacky slapstick film but a down-to-earth genuinely funny comedy. Even Freddie "Boom Boom" Washington and Barbarino would approve!